The Day of the Dead is primarily a Mexican tradition celebrated throughout Mexico and around the world in other cultures and focuses on gatherings of family and friends to pray for, and remember, friends and family members who have died. The celebration takes place on October 31, November 1 and November 2, and traditions include building private altars and honoring the deceased by leaving sugar skulls and marigolds at the graves of the deceased. 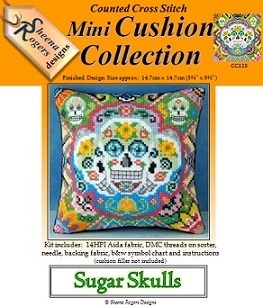 It is these colourful skulls and flowers that have been used as the inspiration for this mini cushion design which is a celebration of both life and death. Only whole cross stitch is required throughout with a little backstitch needed for some of the details.